Dr. Tu’i Uata, a business man who was not elected by voters to Parliament has been elected by Hon. ‘Akilisi Pōhiva as his Minister of Labour and Commerce, according to a lineup list leaked to local media. The Prime Minister may appoint no more than four cabinet ministers from outside Parliament, according to the constitution. Hon. Pōhiva has elected Tongatapu 2 MP Sēmisi Lafu Sika as Tonga’s Deputy Prime Minister when his lineup was submitted to the palace office yesterday. The submission was made after His Majesty King Tupou VI appointed Hon. 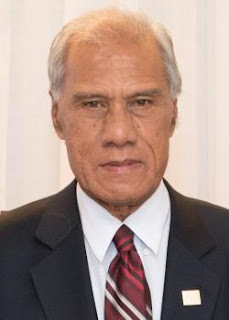 Pōhiva as Tonga’s Prime Minister until 2021. “In accordance with Clause 50A of the Constitution of Tonga, His Majesty King Tupou VI has appointed the Prime Minister-Designate, Honourable Samuela ‘Akilisi Pohiva, as the Prime Minister of Tonga, with effect from 2 January, 2018,” the Prime Minister’s office said in a statement. The Prime Minister has the power to nominate his cabinet lineup before recommending the king to appoint them, according to the constitution. Lord Ma’afu has been re-elected from the nobility by Hon. Pōhiva to be his Minister of Land and Survey. The Ministry of Defence, a portfolio the noble held in the Pōhiva government before the November snap election, has been removed and brought under the control of the Prime Minister. The Ministry of Custom and Revenues has been brought under the control of the Minister of Police Māteni Tapueluelu. Four of Hon. Pōhiva’s Democratic Party team who had been elected after the snap election on November 16 did not have portfolios. They were Tongatapu 5 MP Losaline Mā’asi, Ha’apai 12 MP Mo’ale Fīnau, Ha’apai 13 MP Veivosa Taka and Niua 17 MP Vātau Hui. The Minister of Justice Hon. Vuna Fā’otusia has confirmed the lineup list obtained by Kaniva News. He said it has yet to be officially announced because it was being submitted to the king. Hon Fā’otusia said some of the legislation regarding government portfolios have to be changed to allow movements of some of the ministries such as Sports and Information. The Ministry of Sports which is currently under the control of the Minister of Internal Affairs was planned to be returned to the control of the Minister of Education. The Ministry of Information was also intended to be attached to the Prime Minster’s portfolios. Hon. Fā’otusia alleged corruption existed in the Ministry of Custom and Revenues and that was why the portfolio was given to the Minister of Police.